I used George and Basic Shapes to cut the word, hearts and star and some Simple Stories papers, which I totally love! on Kraft cardstock. 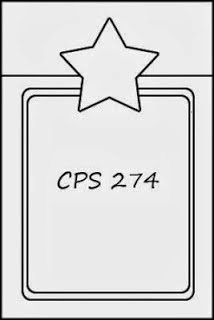 I actually made my card about 7" long, adding an extra piece of carstock with the star to overlap the card front. I pulled out this stamp from a set I have had for so long, and really need to remember to use more! 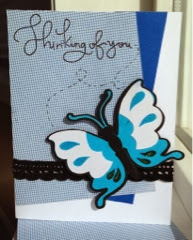 I layered my die cut negative on black cardstock, rounded the edges and added some white gel pen highlights to the hearts and stitching lines around the card edge. I'm not quite sure who I'm giving my card to, but since I'm always in need of a few extra Thank You cards I'm happy to add it to my stash. I hope you have all had a wonderful weekend and are looking forward to a happy week ahead. 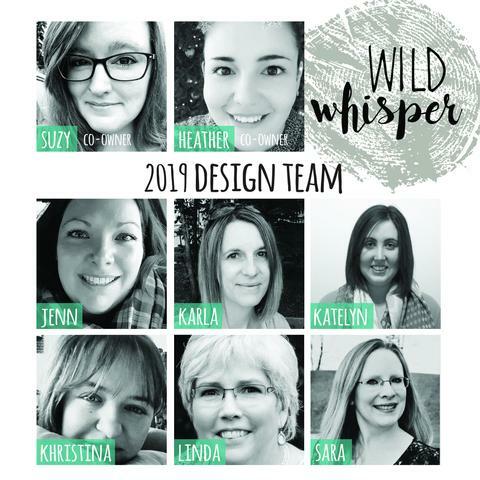 Please check out all the wonderful projects our design team has put together and add your card for a chance to win a great prize! This was a beautiful, warm end of summer day and I wanted to capture the fun spirit of the moment. Everyone knows when two girls get giggling there's no one who can be serious! The theme worked perfectly with the theme this month at Scrapping Everyday Miracles - Laughter. I saw an amazing layout by Birgit Koopsen in the magazine Scrap 365 - a fabulous UK magazine and I used it for inspiration. I used the Cricut to cut the tags and leaves (Art Philosophy), FUN (Create A Critter), giggles (Cursive 101) and bird and feathers (Straight From The Nest). I also die cut the words on the tag on the right, inside my tag, using my Gypsy. 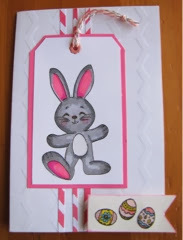 I first placed the tags over the cardstock and spritzed with Dylusions Spray Inks, and then I moved the tags around to different spots to mix up the colours. This poor bird! He was an off white, but I knew I wanted to do something with him. First I spritzed him with spray, but he blended in, so I sprayed him blue, then black - ick, not a good combo. I tried spraying with white, but by now that wasn't working either. I ended up laying a Heidi Swapp stencil over him, but he was so twisted it went all smudgy when I layered the homemade texture paste on, lol. I straightened him out as well as I could and added Distress Ink around the edges and after I put a little rhinestone eye on him, I actually liked him! I like how the blue from underneath started coming through the paste! I love how these feathers turned out! I used watercolour paper to die cut them and then smooshed Distress Inks on my craft sheet, spritzed with water, and pulled the feathers through the colour to create a marble watercolour effect. After I sprayed my title I layered it on black cardstock and then sprayed over top with Dylusions white ink. Love the speckles! I hope you have a wonderful, fun week ahead, full of smiles and laughter! My wonderful hubby had a birthday not too long ago and I wanted to make him a card to show him how I thought this was a lucky year for him, as well as letting him know how lucky we are to have him in our lives! I made a marbled background with Distress Paints and layered it over some red cardstock. And, since Pho soup with noodles is one of our favourite treats it worked out perfectly! I cut the cute noodles, bowl and chopsticks from the Create a Critter Cricut cartridge. I die cut the Lucky and 44 with the Cricut as well and added some Distress Ink around the edges. The bamboo shoot was from the same cartridge and I stamped the sentiment inside. I hope you are all feeling lucky and very blessed for the wonderful things in your life right now. 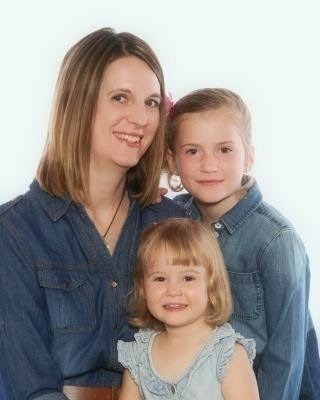 Even on those days that are stressful I try to remember all the amazing things I have and I do feel very lucky. It doesn't seem very long ago when summer was last here! 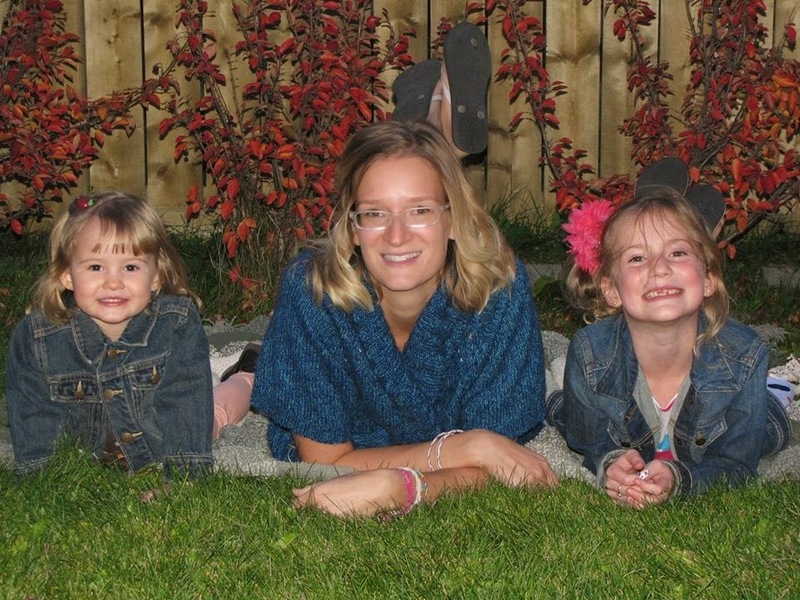 It reminds me of how fast the seasons change and how quickly little ones grow. Amie was having some fun here in these photos posing. More often than not now she just wants to make funny faces so I wanted to take advantage of her sweet smile. 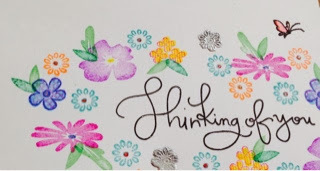 I used a background of some patterned paper by Basic Grey (floral) and CTMH (script) and used this month's sketch from Scrapping Everyday Miracles challenge. The glittery title, bird and flower are a set from Fancy Pants Design that are all on acetate - so cool! 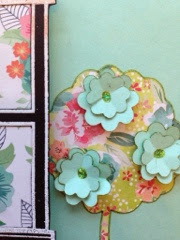 I used some light blue stickers from Cosmo Cricket and the Chit chat stickers from Tim Holtz to embellish. 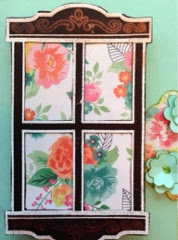 I doodled around the Tim Holtz stickers and added a heart and Glossy Accents to the tab. 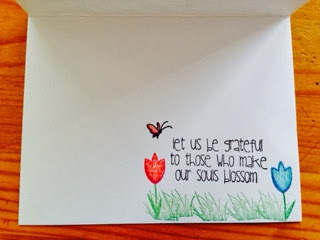 Scrapping Everyday Miracles - March sketch challenge. I used the stamp set 'Enjoy The View' from Marks Finest (our sponsor!!) for the window and sentiment. I love this stamp! 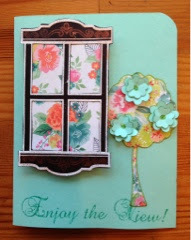 Since I was going for a spring feel for this card I backed the window with a floral paper, which was included in the Simon Says Stamp February card kit. 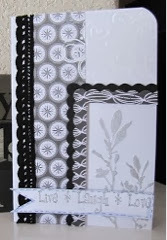 I stamped the window on black cardstock with white embossing powder, cut out the panes and then stamped the swirly trim with Versamark and added Perfect Pearls. The tree and flowers were cut with the Straight From The Nest Cricut cartridge. I added a dot of Stickles to the centre of the layered flowers after creasing them in the centre to give them dimension. The sentiment was stamped with green Distress Ink and then clear heat embossed. We have really been enjoying the warmer weather, and even though it is not THAT warm, I'm finally looking forward to seeing flowers poke out of the ground in the not too distant future! Last month the swap group I'm in created mixed media quote cards, based on our favorite movie. I took this quote from Elf - one of my favorite Christmas movies! I was inspired by an art journal page featured on http://www.clips-n-cuts.com/2013/10/art-journal-take-life/ She is such a talented artist! I first layered papers over a 5x7 piece of cardstock with Mod Podge and added Distress paints to the background. I stamped with some stamps from a coffee ring/spill set from CTMH with brown chalk ink. Then I used Vintage Photo Distress marker to shade around each cup and then traced around them with a black pen. 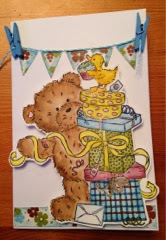 I used a tea cup stamp by CTMH and stamped a variety of patterned papers. Sometimes I used the stamped side and sometimes the back. I printed the quote and cut it in strips, using Distress Ink around the edges before putting it on the background. I added the swirl and spoon and coffee stamp from the same set as the cups. I love the way this turned out, and I think I need to make one to frame for my kitchen! Wishing you a wonderful, creative weekend! 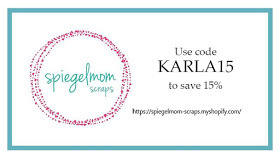 I'm so excited to start another class at Online Card Classes! 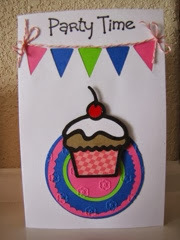 This time the class is focusing on clean and simple, one layer cards. Neither of which I normally do, but I'm a big fan of the teachers in this class and am excited to learn some new techniques. 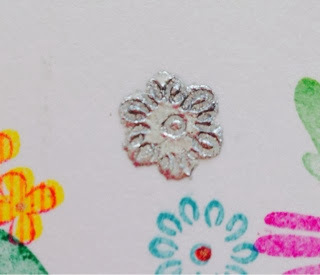 The first card features a faux metal embellishment, created by stamping Versamark through a punched image and heat embossing with silver powder 3 times, and then after the last application quickly stamping with a flower stamp to create an impression. 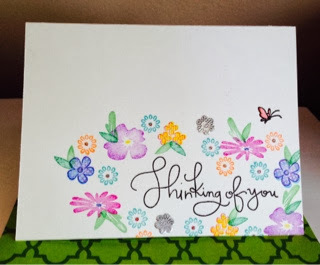 I used Simon Says Stamps from the set that came with the February card kit for the sentiment and several flowers, as well as some small flowers I had from different sets. Here you can see a close up of the faux metal. Neat effect! All these flowers definitely make me think of springtime! Inside - I combined several stamps from different sets to create a fun, coordinating inside! 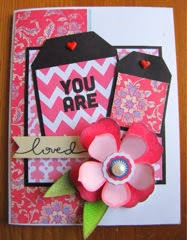 For Valentines Day the Design Team at Fantabulous Cricut made a card kit swap to exchange with another member. 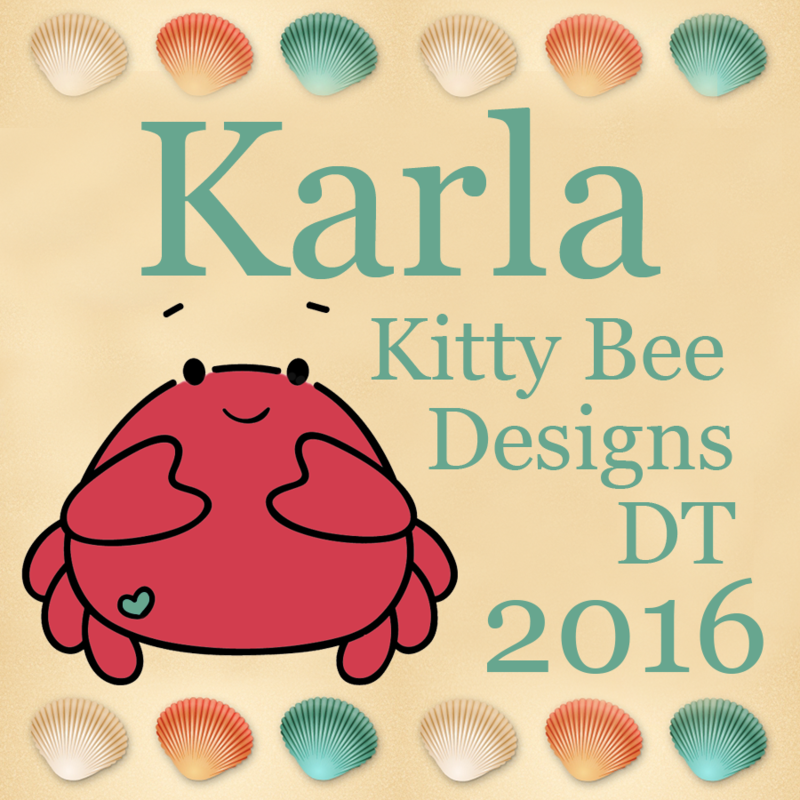 What a great way to get to know other DT members! I received an amazing package from my DT sister, Liz, at Unik By Yes that I have to share! So excited to start creating! 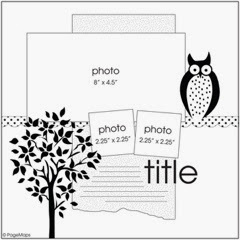 Stamped images and Cricut die cut images to use on my cards. Card bases, cardstock, and patterned paper. Border strips and paper goodies. Oh and Lindt chocolate goodies (Erica already ate one, lol)! Rickrack, paper flowers, pearls, mini clothespins (too cute! ), wooden embellishments and brads. Jamberry nail wraps and emery board - I'm very excited to try these! This was such a treat to receive in the mail! 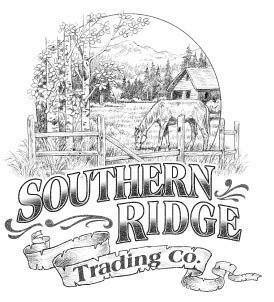 I'm excited to make some awesome cards with all these fun supplies, and Ill be sure to come back to show you them! Here are some cards I've created so far. 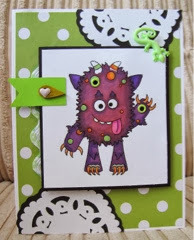 Check out the recent posts on this blog to see details and close ups for each card! Harry Potter Quote by Sydney!